Heat the butter in a large saucepan over low heat. Add the eschalot and garlic and cook for 3–4 minutes or until softened. Add the wine and cook for 1–2 minutes or until reduced. Add the pumpkin and stock and bring to the boil over high heat. Cook for 14–16 minutes or until the pumpkin is very soft. 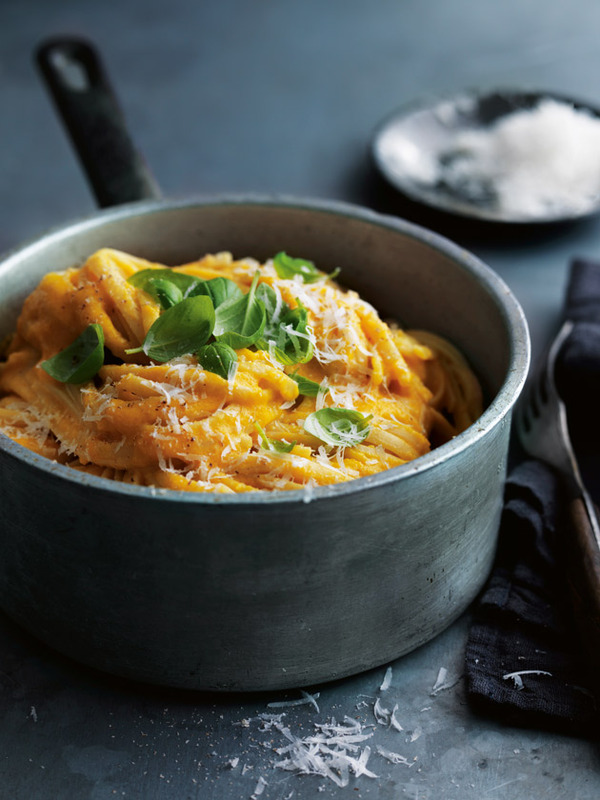 While the pumpkin is cooking, cook the pasta in salted boiling water for 6–8 minutes or until al dente. Drain, reserving ½ cup (125ml) of the cooking liquid. Using a hand-held stick blender, blend the pumpkin until smooth. Add the cream and reserved cooking liquid and return to the heat. Add the pasta and toss to coat. Serve with pecorino, basil and nutmeg. Serves 4.